The “best player in the world” lost to Patty Schnyder, Cornet lost to Bondarenko the Lesser, Jankovic took her time to beat Dulko, Kirilenko finally won something, Lisicki won, Ivanovic won, Wickmayer won, Chakvetadze somehow won, Pennetta won, the Woz won while the Kuz beat Dani, the Bovina comeback continues, Dokic won in Bucharest and King Kolya won in Estoril. 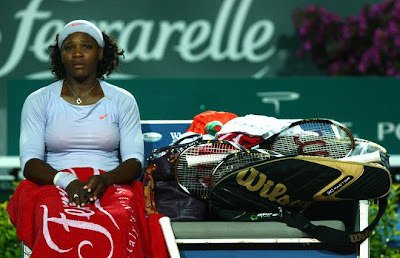 At a time when the much maligned Safina is diving around the dirt to win, the self proclaimed best player Serena Williams looked sluggish losing to Schnyder in Rome. It’s easy to payout on someone who sets themselves up so wonderfully for a fall like Serena did yesterday: “We all know who the real No. 1 is.” Uh oh! It is only her first match on clay for the year though; the real problem here may be her inability to shut up when asked about rankings. Lleyton Hewitt’s now been around for so long that he finally scored 500 wins. Tomic and Rogowska didn’t have to undertake a WC playoff for their French Open spots as there wasn’t time. Wannabe Aussie Anastasia Rodionova is still playing 25K OZ Challengers - last week she won Bundaberg (beating French WC recipient Rogowska), this week Ipswich where she’s top seed. Mad Damir Dokic update – I’m mad, bad and I’ll blow up your car!